Click on the “Browse” button and navigate to the downloaded “Aaleyia.zip” file and click Install Now. 1. Extract the downloaded “aaleyia.zip” file. 2. Upload the aaleyia.zip folder to the /wp-content/themes/ directory. 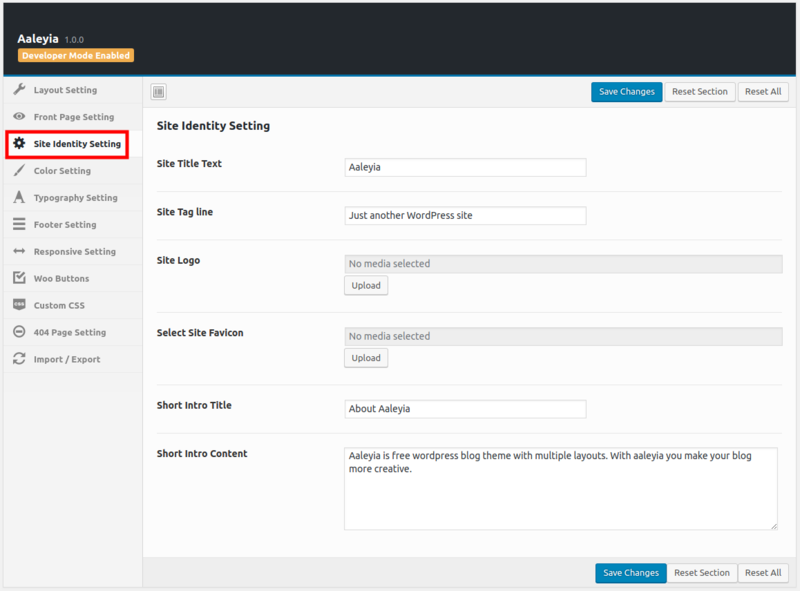 Aaleyia supports 5 WordPress native post formats. Aaleyia theme requests featured images for all posts. It is used by all blocks and layouts to display your content. Aaleyia supports most of the post format. 1) Navigate to Post -> Add New. 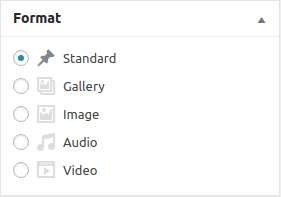 3) Input the URL or you can upload your audio, video, gallery and so on from adding media. 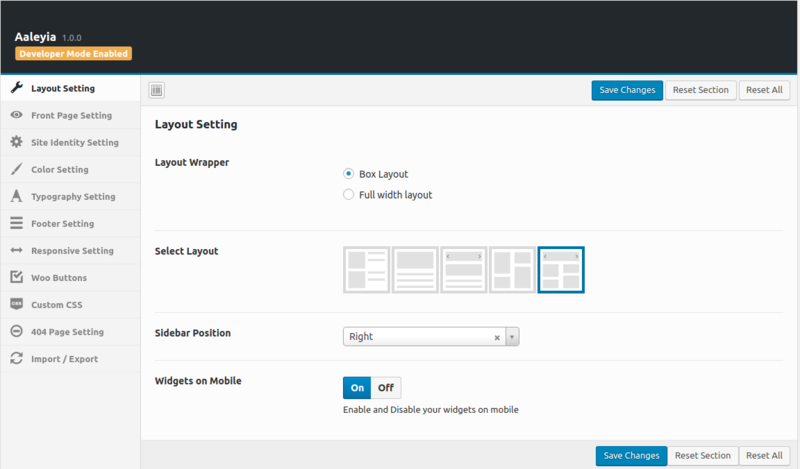 1) Layout Wrapper: Select the wrapper for the Theme For Box Layout or Full Width. 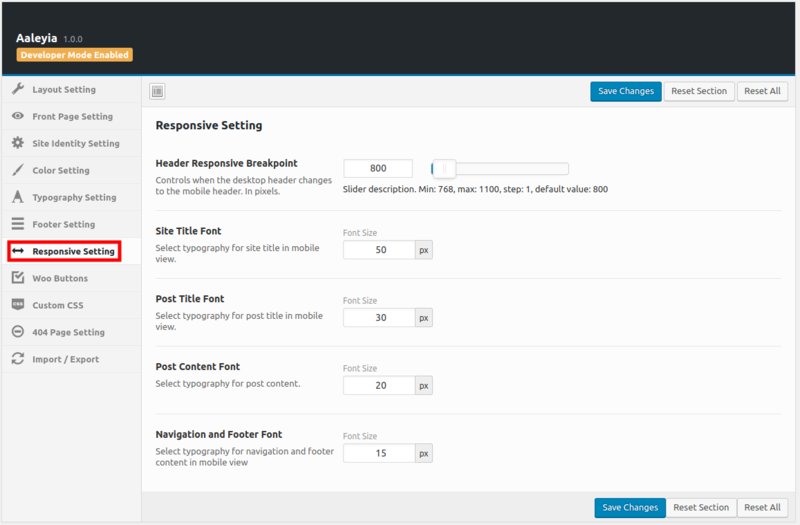 2) Theme Layout Option: we provide 5 type of option for the theme layout. 3) Theme Sidebar Option: we provide two type of sidebar option as the left sidebar or right sidebar. 4) Widgets on Mobile: To Enable/Disable your widgets on mobile. 1) Category for the Slider: Here you can set the category wise slider. 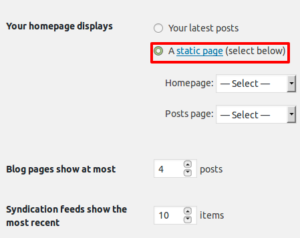 2) Category For Post Listing: Here you can set the category wise Post. 3) The number Of Category Listing: You can pick the number of posts listed in the category. 4) Featured Post Title: Here you can write the Tagline on the Featured posts. 5) Featured Post Description: Here you can write the description on the Featured posts. 1) Site Title: Here you can give the site name. 2) Site Tagline: You can give the tagline for your site which is displayed below the site name. 3) Site Logo: Here you can easily upload your site logo. 4) Site Favicon: In this section, you can add a favicon image of the theme. 5) Short Intro Title: you can write here your short intro for your site. 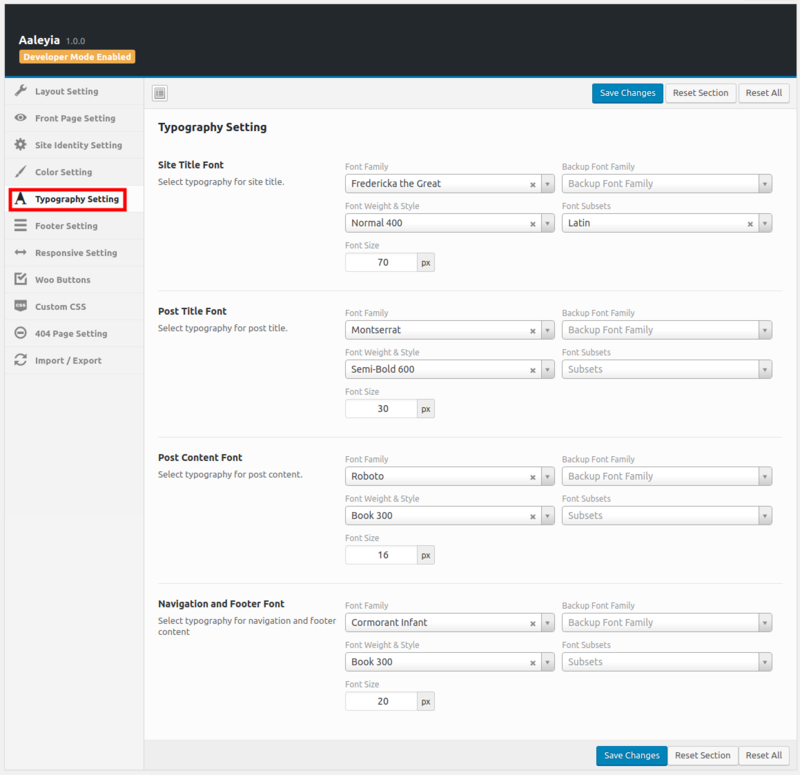 6) Short Intro Content: you can insert short intro content from here for your site. 1) Theme Background: Set the background color and image of the theme. 2) Theme Main Color: Here you can set the main color for the theme. 3) Theme Text Color: Here you can set the text color for the theme. 4) Header, Footer, and Button Text Color: Here you can set the color of the Header, Footer, and Button Text for the theme. 5-Theme Menu Hover Color: you can set the navigation menu background color on hover. 1) Site Title Font: from here you can select typography for the site title. 2) Post Title Font: You can select typography for the post title. 3) Post Content Font: You can Select typography for post content. 4) Navigation and Footer Font: From here you can select typography for navigation and footer content. 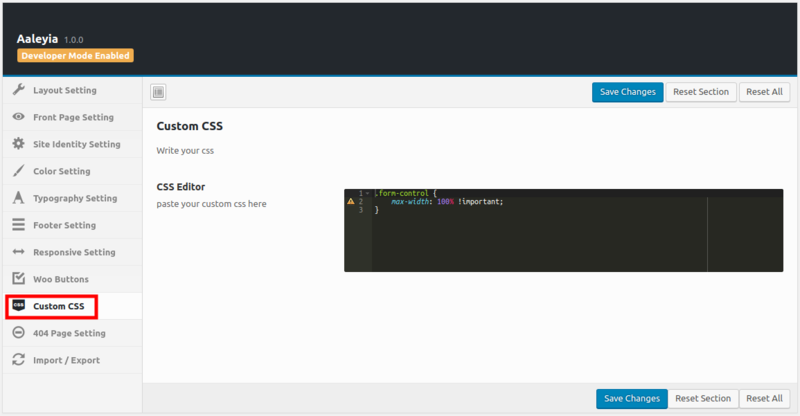 1) Footer Text Editor: Here you can choose the font for the footer content. 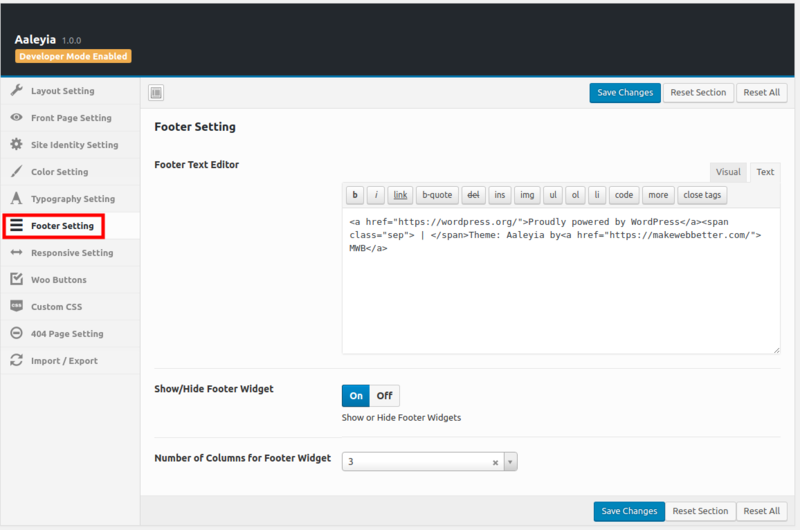 2) Show/Hide Footer Widget: Here you can show/hide the widgets of the footer section. 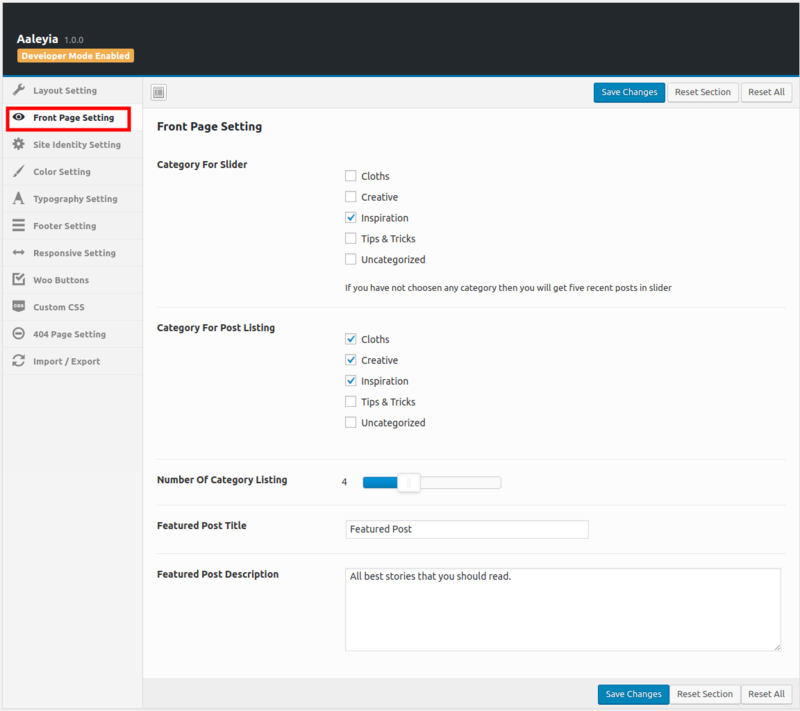 3) Number of Columns for Footer Widget: In this section, you can choose the number of columns to be shown in the footer of the theme. 1) Header Responsive Breakpoints: You can control the pixels when the desktop header changes to the mobile header. 2) Site Title Font: You can select the typography of text for the site title in the mobile view. 3) Post Title Font: Select typography of text for post title in mobile view. 4) Post Content Font: Select typography for text for post content. 5) Navigation and Footer Font: Select typography for navigation and footer content in mobile view. 1) Woo-Checkout Button Background Color Option: Change Primary Button Color for Checkout button Woocommerce. 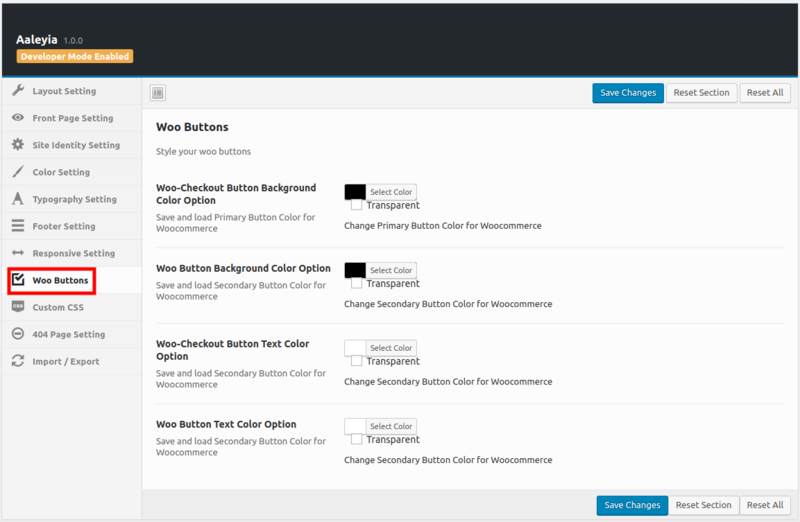 2) Woo Button Background Color Option: Here you can change the background color of original WooCommerce Buttons. 3) Woo-Checkout Button Text Color Option: Here you can change the Text color of original WooCommerce Checkout Buttons. 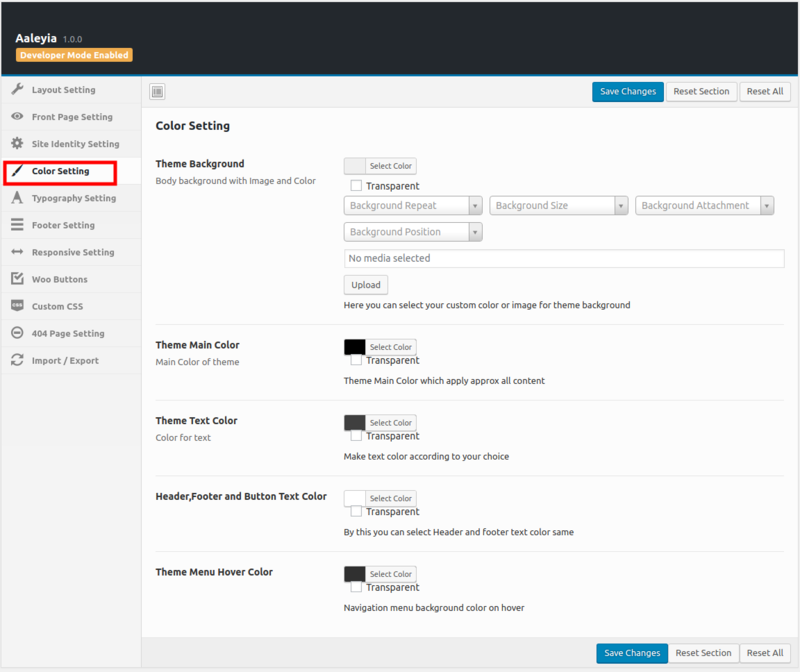 4) Woo Button Text Color Option: You Change Text color of original WooCommerce Checkout Buttons. Add the slider to the Front Page, Navigate to Aaleyia Setting-> Front Page Setting -> scroll to “Category for Slider-> Category for Post-Listing->Number of Post Listing->” select the post and category. 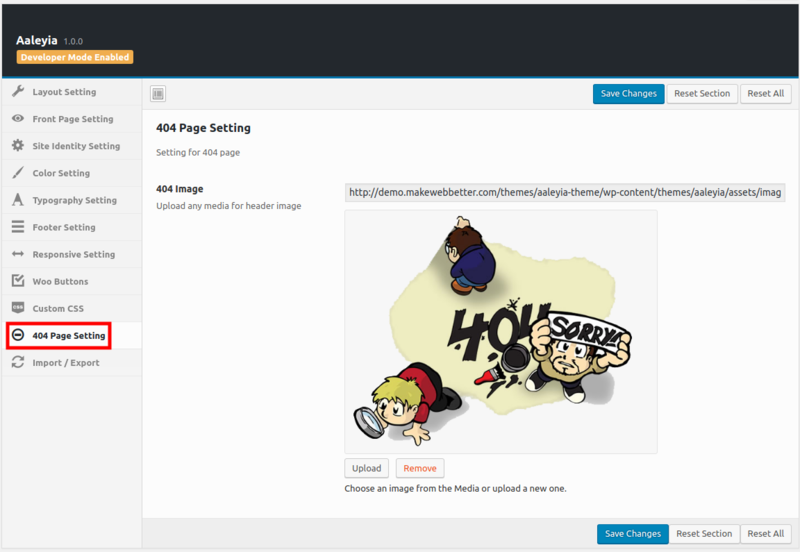 for more description refer to the Theme Options->Front Page setting. You can select the posts category to the Front Page, Navigate to Aaleyia Setting-> Front Page Setting -> scroll to “Select Slides to be shown in the slider in front page” setting and upload images for the slider. Add the slider to the Front Page, Navigate to Aaleyia Setting-> Front Page Setting -> scroll to “Featured Post Title-> Featured Post Description”write the content for the featured post. 1) Sidebar: This is default sidebar in the theme. You can use the widgets in this area if you want them to show in posts, pages.